From the customization perspective, this rental WordPress theme can be edited visually with Elementor builder, without any tech knowledge involved. So even if you are a property owner, youâ€™ll be able to set up and customize the website yourself. Featuring vibrant and elegant design, Ciestra is just perfect for beachfront hotels and resort accommodations. Add all your listings with amenities, bed types, sleeping arrangements, pricing and more categorized details. Rent out unlimited properties with no commission. Ciestra is powered by our custom plugin - the popular WordPress reservation system. Itâ€™s a built-in powerhouse for all your bookings, properties directory, seasonal prices, rates and the whole array of tools for lodging business. The premium room & property booking plugin is included for free! Keep your website up-to-date with what guests want: provide helpful info about nearby bars and attractions, services, landscapes, events and more. The theme is equipped with unique, easily editable Elementor content modules for creating a perfect pre-vacation experience for your guests. Donâ€™t miss on other popular listing websites! Rent out the properties elsewhere and sync bookings to your independent website built with Ciestra. No need for paid for channel managers, no commissions. The reservation system is able to automatically sync your hotel bookings to external OTAs via iCal (make sure the medium platform supports iCal). You are free to enable guests to pay online safely a full or deposit price (fixed / percentage) or charge them after arrival. There are several out-of-the-box payment gateways you can enable: PayPal, 2Checkout, Stripe, Braintree and Beanstream/Bambora. A user-friendly Pro add-on is available for more gateways. Need to set up a complex & dynamic pricing system? Set custom rates for peak seasons. Discount your hotel rooms or other resort accommodations automatically for a longer stay with weekly, monthly or other customizable rates. Designate price variables based on the roomâ€™s capacity. Any rate and pricing is easily tunable. For each property and season you can set up min / max days to stay, available check-in and check-out dates, block chosen units for a certain period of time and more. Availability calendars of all properties will display available and unavailable days in real time according to your rules. An easy way to entice guests to buy more extras along with the property bookings: offer extra packages and services and eventually find a bigger sum in every check! Set the price per accommodation / guest; once or per night. You can also offer free services that must be booked in advance. 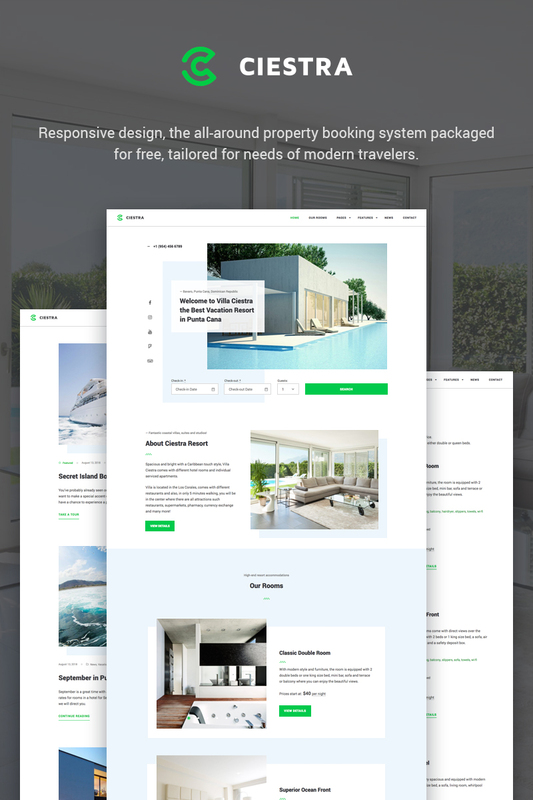 One of the main strengths of this WordPress hotel template is 100% user-friendly customization: tune in every piece of Ciestra with Elementor visual page builder and other WordPress tools. Intuitive drag-and-drop content manipulation, inline editing and more things non-tech users love. Lots of marketing studies show that people explicitly use Instagram to choose travel destinations or plan vacations. With Ciestra, you can focus on image storytelling with a lightweight and beautiful Instagram gallery that automatically displays a feed of your latest Instagram uploads. Unlike many other WordPress themes for hotels, Ciestra is absolutely easy on installation & getting started thanks to dummy data that you can import in one click. The data importer is packed with the theme allowing you to replace sample info with your custom content with no hassle. * Added the ability to change primary theme colors.